Choosing Mindful Love: It's a Mind Full! A nugget of brilliance and so spot on! She is so right. Good relationships truly are about being mindful. Mindful of your own thoughts, opinions, feelings, self-talk. Mindful of the way what you do and say affects someone else. Mindful of the other person’s experience, emotions, opinions, ideas. 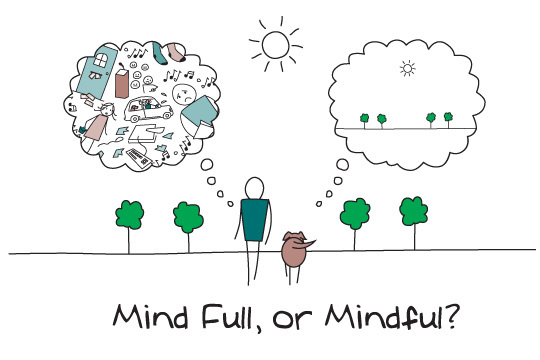 Mindfulness truly matters. Mindfulness, said another way is awareness. How aware are you right now of your own thoughts, opinions, self-talk? How aware are you of what is going on around you? Since it is safe to assume that at this very moment you are reading my musings, your awareness of what is going on around you is likely temporarily diminished…but what about your awareness of your thoughts, opinions and beliefs? Do you belief that awareness/mindfulness is akin to the glue that holds a relationship in blissful connectedness? I do. All human beings easily fall into a lull of routine when it comes to day to day occurrences that no longer seem new. This is how we get into a groove, or a “zone” and after awhile it is easy to lose awareness of things that are all too familiar. For example, there is a bulletin board here in my office. It sits above the right side of my desk. I can see it as I am writing – it is in my peripheral vision. I look at the items on this board every day and it has been a long time since I have put something new on there…and yet if I don’t look directly at it, I would struggle to list for you all the things that are on it. Do they matter to me? Yes. I only put sentimental, emotion or memory evoking things on that board. It is a feel good place for me to look, yet it is also so commonplace to me now that if something disappeared from it, it may take me a long time to realize it since I rarely actually look at it in detail anymore. It is easy to do with in our relationships too. Day and day out we see the same people in our lives and without mindfulness we run the risk of not “seeing” them anymore. They are still important to us, but we fail to stop and notice and discover them again the way they are right now. Do you believe that people can change? I believe they change constantly, and in many ways. Not only do we physically change with time, but every moment, every experience we have in our lives changes something about us. The person you met five minutes ago is changed somehow just by knowing you five minutes later…and you are different too. For this very reason alone, failing to stop and see each other how we are in this moment means that we no longer see each other but instead of looking at each other through the lens of what we believe each other to have been up to now. Our beliefs tell us how to think about the world and everyone in it – even how we think about ourselves. How aware are you of your own personal beliefs? Many of our beliefs were formed early in our childhood or by some kind of strong emotional past experience. Our beliefs are formed and then many of them settle in under the layer of our consciousness and become automatic. Ever know someone who was bitten by a large dog when they were a child? Chances are they are already immediately more cautious of large dogs as an adult, even if they don’t directly remember the experience. This happens too once we have had our hearts broken a few times, or someone we loved leaves us. We see ourselves and other people in a new way and the possibility of pain and loss brings up subconscious ways of protecting ourselves against it. If loss and pain happens often enough, we learn to expect it to happen again. We see people as time bombs that will eventually hurt us, leave us or make us want to go, but is that who they really are? It is just the way we see them, or rather, how we fail to see them. Being mindful of our own beliefs, fears, wants, hopes, dreams is the best way to identify and manage our own expectations in relationship. Get present. See the amazing person before you; and inside of you. Appreciate what is right now. Your love will thank you.